Preheat the oven to 190°C, gas mark 5. 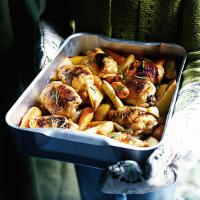 Arrange the potatoes, parsnip and carrots on the base of a large roasting tin. Remove the vegetables from the oven and nestle the chicken pieces between the vegetables. Mix together the honey, orange zest and juice, and season lightly, then pour it over the chicken to make a glaze.